We kind of miss theatre-going with the kids after many months of busy days with our respective house-renovation, moving, then school. The kids have been repeatedly asking for some edutainment. 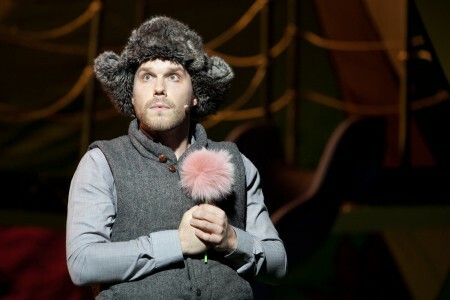 The last one we attended was the amazingly impressive season finale – I Theatre’s The Magic Paintbrush which left us all awed and inspired by the talented uncle Brian (Seward). Both Audrey and I love musicals since young and we love how I Theatre shows engage the kids, as well as the adults. It is definitely not easy to edutain an audience with a large age differences at the same time even though the performances are primarily targeted at the children. We always leave the theatre with meaningful conversations with the kids after the bonding over a staged musical. In case you don’t know who the sparkle behind I Theatre shows is, it is Brian Seward, a veteran Artistic Director who has been with I Theatre for more than a decade. Just last month, Brian marked his 16th Anniversary with I Theatre. We also found out that before coming to Singapore, he taught Drama in schools. This means that he has dedicated a large part of his life to children theatre and arts. Come 27 April to 14 May 2017, join us at the Drama Centre Theatre, NLB, for an extravaganza of children theatrical favourites to the tunes of The Goose That Laid the Golden Eggs, and her greedy owner; The Little Red Hen, with bread to bake, but lazy friends; and Chicken-Licken – with that scary acorn! A brand new, interactive, fun, musical production presented in quite an unusual way. This time, we’ll get to look at the world of the Theatre Stage from the inside out and discover valuable secrets of how a Musical is made! Poultry Tales looks set to be a visual and sensory treat for the whole family. How a theatre play is staged, and the roles of backstage crew. Guaranteed to engage young and old alike, specially designed with excitement, humour and learning points coming thick and fast! We are really excited and has marked our calendar for the show. Tickets can be purchased at SISTIC Website if your family love theatre-going learning journeys like ours. Stay tuned to us, for we have a surprise coming up very soon! Today, let’s talk about Don Bosco‘s “Lion City Adventures – Secrets of the Heartlands” for primary school children since it’s school holidays now. With the book and some walking around, the kids can really get to know our Singapore towns (8 of them) with bites of history, quirky facts & cool stuffs and also get to solve some mysteries with the members of Lion City Adventuring Club (LCAC) as they go along from town to town. Secrets of the Heartlands is the sequel to Lion City Adventures and it leads to the new title – Island of Legends, published just few weeks ago. Together with the members of Lion City Adventuring Club (LCAC), we journey back in time to see how the fascinating heartlands of Singapore have evolved. Each chapter contains a history of the neighbourhood, information about remarkable people and events and a fun activity. To make things more interesting, children will get to solve puzzles and mysteries as they unravel clues from town to town. Lion City Adventures is a very informative and a good guide book on Singapore for primary school children. Seldom is there a guide book that is published for the purpose of really appealing to the young ones with full-colored print and matchy illustrations that speaks to the little ones. The font size is pretty good for the eye as well with catchy headers to capture the attention of the young ones. Notice I am straying away from mini-fonts. It’s like a sign of “flower eyes”. Likewise, kids wouldn’t like tiny fonts too. The layout of the pages is also not too dense such that it makes reading topics related to general interests boring. The “Instant Expert” section listed some information that is so close to heart. Even I had learnt a bit of facts I never did know (failed the super boring History in Sec 2, you see >.<). 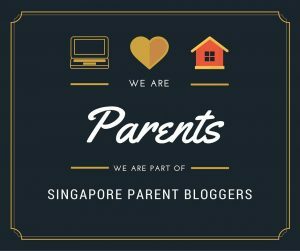 Now that I’m older and wiser, such information becomes more interesting to me and that I am also more motivated to read and learn so as to share with the kids and make general knowledge about Singapore interesting for them. My mum used to tell me about my grandfather sending her and my aunty out to buy 20c of Tock-Tock Mee and how they would steal a bite before they get home. As girls and being the elder ones amongst siblings, they don’t often get equal treatment in their generation. 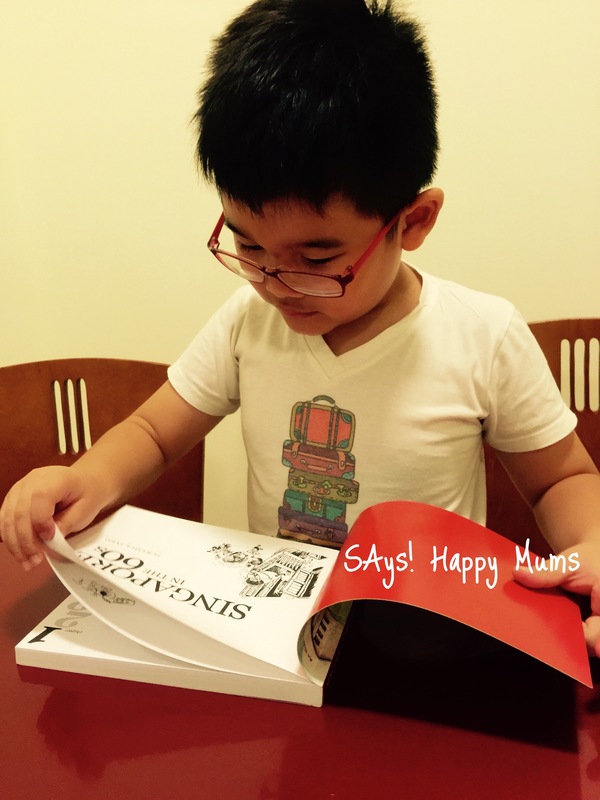 Lion City Adventuring Club (LCAC) is also connected to the Sherlock Hong Adventures series of books which Jiejie loves so well. I spotted different titles of the series in her school bag more than a few times by now. I guess my gut feel was right then – Detective Sherlock Hong going around town to solve different mysteries having a historical link to Singapore’s olden days did attract the kids. We shared about The Legend of Lady Yue earlier. I like this series of Lion City Adventures personally and thought that the kids would benefit from something more interesting than fact sheets and boring history books. Before they grow up too fast, becomes less inquisitive, more academic, now is the best time to start them on such little adventure journeys around Singapore while they are still in lower primary. Ideally, use the book together with field trips for maximum benefits. Also note that, having one book per child would allow them to develop and read at their own pace. The kids would be impatient to share a book, especially if there more than two of them in the family. Right now in June holiday is the best time to plan for field trips with the kids if your family is not travelling. Each copy retails at $15.80. All of Don Bosco’s books can be found at Popular, Kinokuniya and Times bookstores, by the way. We spotted his books at Times Bookstore, Punggol Waterway during their media launch. Alternatively, you might like to buy online at http://www.marshallcavendish.com/marshallcavendish/genref/SearchResults.aspx?ti=Lion%20City%20Adventures&is=&au=&im= . Don Bosco writes mystery, fantasy, science fiction and thriller stories. He describes himself as “geeky and cheeky”. His books are created around brave and curious young characters who are forced to face incredible challenges and take on horrid villains. The plots are fast-paced and spiced up with a tasteful dose of imaginative magic. To find out more, visit his website at www.supercoolbooks.com. We are grateful for the opportunity to receive Don Bosco’s Lion City Adventures series, for the purposes of this review. We were not remunerated monetarily for the review, all opinions and experiences remain our own alone. All photos unless otherwise mentioned are copyright of SAys! Happy Mums and were provided for the purposes of this review. All other photos remain the copyright property of SAys! 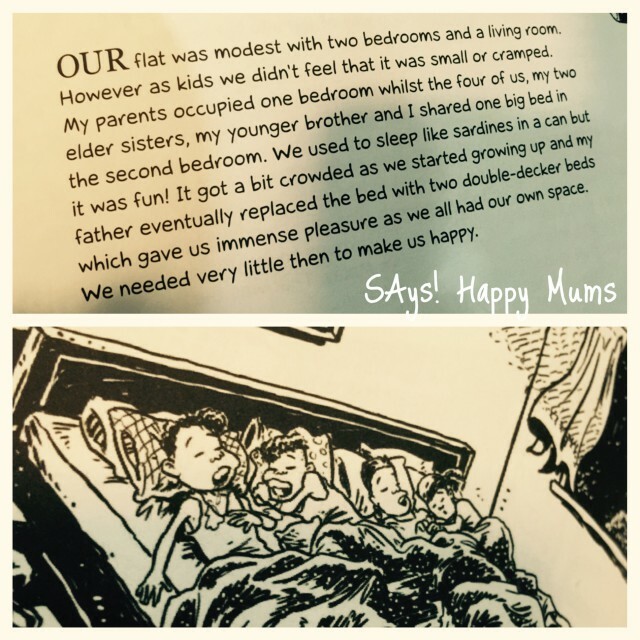 Happy Mums and may not be reproduced without prior notice or written permission given. The Rainbow Fish is one of the most treasured childhood stories to share with little ones. Finally making a comeback after it’s previous run 5 years ago, I Theatre is staging this timeless classic at the Drama Centre Theatre from 26 April to 15 May 2016, so do book early at SISTIC to avoid disappointment! Both Didi and Wey were just teeny tiny 22-Month bubs the last time I Theatre staged this musical in Singapore, and even then they had a good time with the Rainbow Fish, and they are all set to hit the theatres to relive their favourite story onstage again. A long way out in the deep blue sea swims a shoal of the most beautiful fish in the entire ocean. Their scales are every shade of blue, green or purple, and ONE has a sparking silver scale…. Meet proud and pretty Rainbow Fish, and her friends, Starfish, Small Blue, Big Violet and Little Green. Rainbow Fish learns some very valuable lessons about her attitude to others, some hard lessons about pride and selfishness, and some valuable truths about the power of generosity and humility. Meanwhile, her friends discover how teamwork helps everyone; and how gossip and rumour can cause damage to friendships! For this incarnation, The Rainbow Fish and other well-loved fishy characters will be gracing the stage together with new characters, including new fish – Tiny Stripes. I Theatre will also be including a perfect marriage of the various techniques learnt over the years, including magical black light theatre, and a blend of live action and mind blowing original puppet design. Whether you’re re-living nostalgia of the very first Rainbow Fish or catching it for the first time, be ready for a brand new bright, shiny, cute and articulate musical extravaganza! We have TWO (2) pairs of tickets with a total worth of $140 for our readers. Winners will be receiving a pair of tickets each. So bring along your family for a great afternoon of entertaining music and drama! Just click on the image below to take part. Do follow the instructions below to take part for your chance to win! Giveaway ends 16 April 2016, Saturday at 0000 hrs. Winner(s) are to self-collect the tickets from I Theatre’s office at 27 Kerbau Road Singapore 219163 (Map) within office hours, before 22 Apr ’16. Incomplete entries will be disqualified without notice. Decisions are final and no changes/disputes will be entertained. Suitable for: Anyone from 3 to 103 years old! Shows in strike out are for school groups only. Our heartiest congratulations to below winners for fulfilling the requirements in the Rafflecopter giveaway! We will be in touch shortly with regards to prize redemption details. If you’ve always hated Literature as a subject but loved reading books simply just to venture into a far faraway land without worrying over Grade A or F, you would be familiar with William Shakespeare and his works. The tragic love story between Romeo & Juliet is perhaps the most classic story used during schools days. Today, 400 years following the death of William Shakespeare, Singapore Repertory Theatre specially presents Romeo & Juliet as the ninth production in the Shakespeare in the Park series. Past productions from the series include The Tempest, The Merchant of Venice, Othello, Twelfth Night, Macbeth, A Midsummer Night’s Dream and Much Ado About. To join in on the celebrations over Shakespeare’s life and works, SRT has chosen to stage what is probably Shakespeare’s most well-loved play, which has had a profound influence on music, film, theatre and debates over the years. For us, it will be our first Shakespeare in the Park experience and we are really excited over the opportunity. If you have any tips to share, please tell us! SRT’s production of Romeo & Juliet will be the biggest Shakespeare production in this part of the world in 2016. It will be a stunning contemporary production created by some of the best theatre practitioners on and off stage. The annual tradition of Shakespeare in the Park attracts up to 30,000 people from all walks of life and is an anchor event in the cultural calendars of many. The young lovers will be portrayed by Thomas Pang (Tribes) and Cheryl Tan (Beauty World and Red Riding Hood), with Remesh Panicker, Shane Mardjuki and Daniel Jenkins in other leading roles. We have TWO (2) pairs of Picnic Tickets with a total worth of $200 for our readers. So grab your spouse or BFF and take part in this giveaway together for maximum chance! Winners will be receiving a pair of tickets each. Just click on the image below to take part. Do follow the instructions below to take part for your chance to win! Giveaway ends 16 April 2016, Saturday at 0000hrs. *Includes priority queue, a spot in the Reserved Picnic area near the stage and an inflatable backrest. Times Bookstore at Punggol’s newly-opened mall, Waterway Point, is big on books and lifestyle! Moving with the times, in addition to a wide range of books, this new bookstore boasts dedicated sections that cater to the lifestyle needs of consumers. This is especially so for the children and families at their biggest new concept bookstore in Singapore at Waterway Point. Spanning a floor area of about 7,335 sq ft with dedicated sections for children, lifestyle products and a workshop area, the new Times Waterway Point seeks to fulfill the promise of being more than a bookstore to cater to the varied lifestyle needs of consumers, especially children and families. This is evident from the children’s section, Times Junior, which spans an unprecedented floor space of over 1,600 sq ft. With this boost in size, Times Junior features not only educational books, activity books and educational toys for the young, but also offers a conducive and fun area within, for children to read or interact with other children. Established in 1978, I remember my childhood from weekends spent browsing through the bookstore at Times Centrepoint. Those made up some of the happiest memories of my childhood as my daddy will keep a look out for us while mum gets to shop at Robinsons. Homegrown book retailer, Times, is a leading retailer of English language books and complementary products in the region with a chain of bookstores throughout Singapore and Malaysia. Times Waterway Point is the seventh bookstore in Singapore for the group. Adopting a cheerful orange palette, complemented by warm brown hues of wood structures and trims, this new bookstore exudes a welcoming and cosy vibe that makes browsing and shopping for books and lifestyle merchandise a delight. With the recent shift in focus on children and families, Times is set to offer a cohesive educational and learning environment for children while having fun at the same time. Inspiring and conducive spaces have been created for parents to spend quality time bonding with their children over exciting activities and workshops. Not only that, other lifestyle books and merchandises are also made available for the adults to enjoy a moment for themselves too. The 600 sq ft island-style Lifestyle Section that can be converted into a dedicated space for workshops, activities or educational classes is a prominent feature within the bookstore. Some of the upcoming activities planned include children story-telling, financial workshops, cooking demonstrations and arts & craft sessions. The rest of the bookstore space offers an extensive range of books catering to readers of all ages and interests, including lifestyle, fiction and non-fiction books and a selection of Chinese and school assessment books and materials for children. In addition, there are also comprehensive stationery and lifestyle offerings, such as premium choices of writing accessories and instruments, gift items and lifestyle accessories. Yesterday’s media event at the opening of Times Bookstore gave us a glimpse of what’s to come at the lifestyle concept bookstore. Aside from Meet & Greet with storybook characters, we participated in a chocolate cake baking session, fiddled with LEGO Mindstorm, made pins and crafts, and got introduced to essential oils. Sign up for a LEGO & Technology Camp from 6th – 8th June 2016. Registration and details at any Times Bookstore! Participate in a baking demonstration or workshop featuring one of the recipe books available in-store! Educational toys and activity packs s are aplenty too. Get ready to be spoilt for choice! Hubby and I are lovers of Science and our family fiddles around with simple home experiments whenever there is an opportunity. I was most pleasantly pleased to find a few awesome Science packs that provides fun and educational purposes at the same time. While taking my time to browse through the children’s collection, I spotted a few favourite series as well as surprise finds. We’ll be going back to check them out again soon. “I Kill The Mockingbird” by Paul Acampora got me very curious. I had loved “To Kill A Mockingbird” but not everybody does so. This title is about an exciting plot to get the entire town talking about the well-known Harper Lee classic. Controversial plans were put in place to get people to read the book. What resulted from all their efforts was a mini revolution in the name of books. Check out this series of baby lit board books. Each one combines elements of classic story with an educational theme. Delightfully fabulous, these board books are sturdy with thick pages and easy for the little ones to flip through. Guess which title this belongs to. We found our new favourite detective/mystery series by local author, Don Bosco, and recently completed a review of The Legend of Lady Yue. Check out the Chinese Cinderella series. Every girl should read this too! These all-time favourites for the young adventure seekers are decked out in their full glory. The Secret Seven series is available in junior full-coloured version as well and I have been looking for the junior series all over the place in order to get Didi interested in Enid Blyton books! Eh oh! He found this!! I can’t possibly showcase all the interesting books I saw. There are simply too many irresistable titles in the bookstore. Shifting to Sengkang soon with a disapprovingly small bookshop at Seletar Mall, Times Bookstore at Waterway Point will very soon be our book heaven later this year. We certainly look forward to returning here to spend the lazy afternoon with the kids. Do check out the bookstore if you have the time. It’s not everyday that we have such a big bookstore in the heartlands. There is no need to go to town anymore! With the new direction of targeting children and families and the launch of this new concept bookstore at Waterway Point, Times is proud to partner one of Singapore’s well-known homegrown celebrity mum, Diana Ser, as its Brand Advocate. The partnership is based on the shared vision between Times and Diana Ser in advocating the benefits of reading via physical books and the importance of fun learning for children”, said Ms Lek. In addition, Diana’s proficiency in not one but two important languages in Singapore gives a glimpse into Times’ plans for the future. With the aim of creating a holistic educational pit stop for children, Times recognises that Diana’s bilingualism in the English and Chinese languages makes her a good role model for the younger generation. This is opportune as Diana recently launched her online edutainment program, ‘Crazy About Chinese’, where she shares fun and easy ways through her personal journey of imparting the Chinese language to her four-year-old daughter, Jaymee. “This partnership with Times is particularly exciting because we are both Singapore brands united in our belief for children to learn through play. Together, Times and Crazy About Chinese will also bring new energy, ideas and resources to parents who are keen to nurture their children to be bilingual!”, said Diana. Looking ahead, Times will continue to expand its repertoire of Chinese books and products beyond the current English-centric domain, providing children with greater exposure to the Chinese language. This 红帽子蓝帽子 series on the right is quite good. Unfortunately my close up photo got corrupted. Do check out this series with HYPY for self-reading and also higher level of difficulty as a step-up from kiddish Chinese titles. Thanks to Times Bookstore and WOM Communications , we attended the official opening and media preview at Waterway Point. Thank you for joining us on SAys! Happy Mums. If you liked what you’ve read on our blog, please follow us on Facebook and Instagram for the latest updates. We hope to see you back again soon. Times Bookstores, the retail arm of Times Publishing Limited, with a chain of stores throughout Singapore and Malaysia, offer a wide variety of book and magazine titles catering to readers of all ages across different genres including but not limited to children’s, lifestyle, fiction, non-fiction, art and business/management. It also offers complementary non-book products such as general and lifestyle gifts, stationery, fine writing instruments, reading accessories and greeting cards and gift wraps. Times Bookstores also host a variety of exciting and vibrant activities, including author appearances, book signings and workshops for customers. 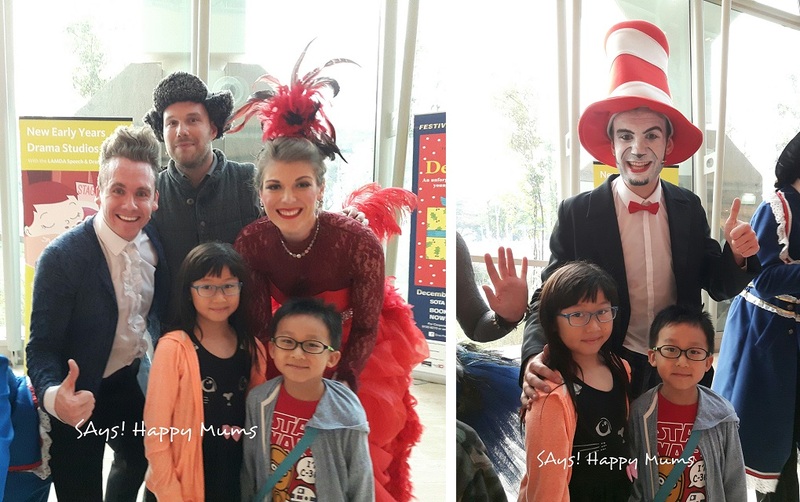 SEUSSICAL THE MUSICAL, jointly presented by ABA Productions and Diva Productions, opened today at the Esplanade Theatre following our pre-event post. I did not imagine that a stage musical with young children as target audience would emerge as one of this year end season’s most gloriously entertaining surprises! The kids and I waited with eager anticipation for the show to start the moment we set eyes on the elaborate and colourful stage set up. There’s a slide on stage, by the way! Seussical the Musical is an eye-popping, high-energy compilation of whimsical stories from the world of Dr Seuss, with a focus on his most famous books – Horton Hears a Who, The Cat in The Hat and Green Eggs & Ham. The musical opened to a sprightly fanfare as The Cat in the Hat and a stage full of familiar characters and creatures in candy-coloured costumes sing to a cherry opening song “All The Things You Can Think” with their power lungs and sleek dance moves. Somewhere in the jungle, Horton the kind elephant heard a tiny voice in the distance and discovered that the voice(s) came from a tiny speck of dust, which happened to contain a small world that is floating out of control through the universe. This tiny planet (Town Whool) belongs to the home of the Whos, including Jojo – a Who with “thinks” that defy all description. Believing that a person is a person, no matter how small, Horton decided to guard and protect it from destruction. However, his jungle neighbours, in particular Sour Kangaroo (I love her power voice!) and the naysayers, mocked at his insanity. Everyone ridiculed him except Gertrude McFuzz (who happens to be in love with Horton), thought otherwise and opined that his selfless care for the littlest people is noble and laudable. Meanwhile, inside the speck of dust right at Whoville, young Jojo (son of Whoville Mayor) caused trouble at his school for “thinking” too much and was sent home to face punishment from his parents. To make matters worse, Jojo inadvertently causes heavy flooding while daydreaming in the bath upstairs. Exhausted with their troublesome son, the Mayor and his wife sent Jojo to the military school for discipline. A week passed and Horton became restless while still watching over the speck of dust. He started speaking with the Whos in Whoville, and to his surprise young Jojo responded. The two became fast friends and bonded over their mutual feelings of loneliness in their respective environments. In another corner of the jungle, Gertrude was frazzled that Horton who did not notice her. Under the influence and advice of the flamboyantly-feathered Mayzie La Bird, she seeked help from Doctor Dake who gave her a prescription for pills that helped enlarge her apparently pathetic-looking, one-feathered tail. Elsewhere, the monkey brothers stole the speck of dust from Horton. In his bid to protect the Whos, Horton chased after them as well as the black-bottomed eagle whom the monkeys handed the speck to. He was greatly discouraged when the speck of dust was dropped into a large patch of other specks that spanned a hundred miles. Not giving up, Horton searched through hundreds of thousands of specks. The audience was also encouraged to assist when he finally lost count after a million and six. The children had a good laughter when apparently Horton couldn’t count further anymore. His search eventually came up empty and Horton felt defeated. Reluctantly, he journeyed home and met Mayzie La Bird who was sitting on an egg. Horton was persuaded to sit on the egg while Mayzie went away for a “short” vacation break, promising to return in a while. Seasons passed but Horton continued to wait for the return of Mayzie patiently, all the while sitting on the egg as he promised, but Mayzie did not return. She was having a good time at the beach! Oh dear, what an irresponsible mother!! I mean, all mothers understandably yearn for some me-time. But this one abandoned her egg and never had planned to take it back! One fine day, Horton was captured by jungle poachers who auctioned him off to the audience (!). Lots of bids offered from the floor later, Horton was eventually sold to the circus. Gertrude McFuzz tried to save him, but unfortunately, was weighed down by her newly-plump tail which rendered her flightless. Horton eventually escaped the circus, reunited with Jojo and the Whos with the help of Gertrude who finally expressed her love for Horton. He was however brought to a trial by his neighbours and accused as being a lunatic. Once again, with the help of enthusiastic audience, and his mightiest attempt, Jojo finally shouted loud enough for everyone to notice his presence. Surprisingly, the Sour Kangaroo decided to stand with him now that she also heard Jojo’s voice too. Later on, the egg that Horton sat on, finally hatched. Guess what it looks like? No prizes for getting it right! 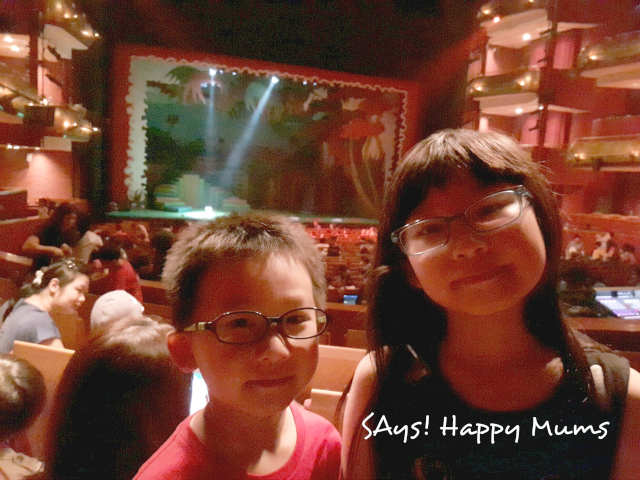 With a surprising amount of enchanting wit and imagination, Seussical the Musical is a wonderful show for the children this year end and is a must-not-be-missed production. 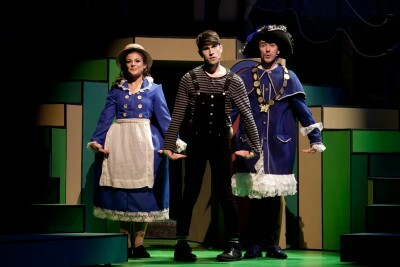 My kids and I had thoroughly enjoyed every minute of the cheery songs and delightful choreography. As I am writing this, I’m still humming to the catchy tunes of “All The Things You Can Think“. 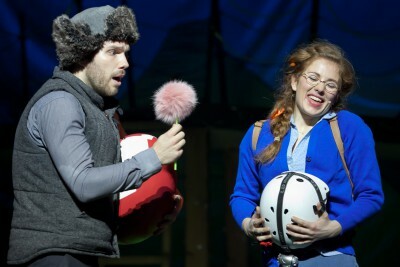 Seussical the Musical will only be staged until 8th Nov ’15, Sunday and there are only 4 more shows to go. So let your toes tap, your fingers snap, and fire up your imagination in the world of Dr Seuss. Don’t miss this fantastic musical that’s just right for the entire family with children aged 5 and above. Get ready for Meet & Greet with the cast after the curtains close, for it is going to be a frenzy of non-stop requests to take photos with the beautiful cast and characters. Don’t say I didn’t warn you! 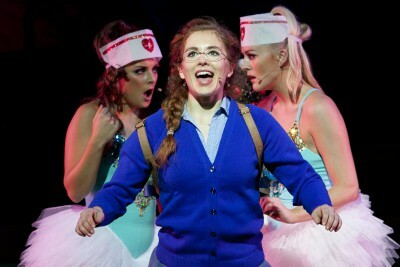 Thanks to ABA Productions and Diva Productions, we have been extended review tickets to catch the awesome musical. Thank you for joining us on SAys! Happy Mums. If you liked what you’ve read on our blog, please follow us on Facebook for the latest updates. We hope to see you back again soon. CHECK OUT THE EXTENDED HALLOWEEN TICKET PROMOTION – $50 FOR CAT 1 & CAT 2 TICKETS, UNTIL 8TH NOV ’15, 3PM!! For more information, visit www.aba-productions.com. 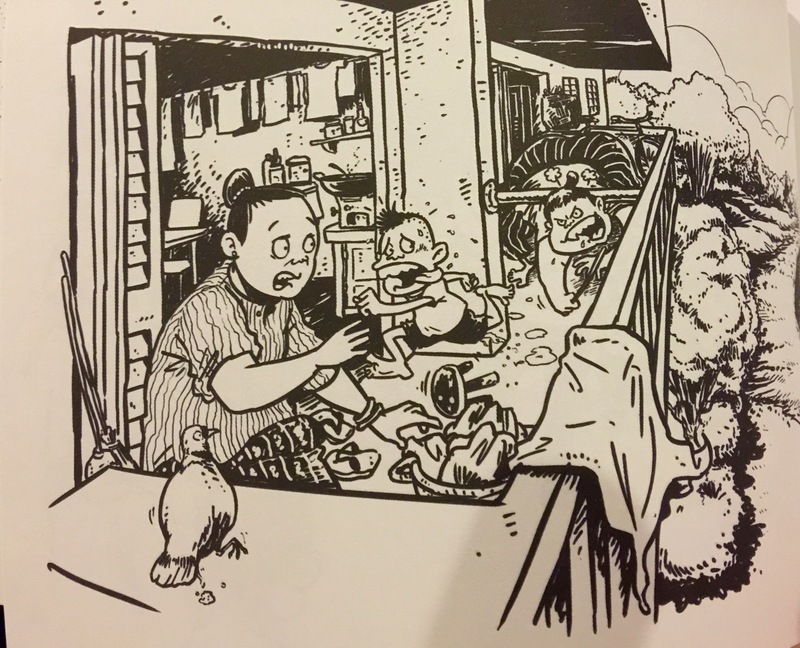 Although I did not know what to expect, I was very excited to receive a copy of the Limited Edition Illustrated book, Singapore in the 60s by James Suresh, best selling Author and co-creator of Mr Kiasu. I was actually hoping to share the book with my 6 year old whose always had an interest in Singapore’s history and times past. Wey enjoys watching documentaries about old Singapore and was a huge fan of the Days of Disaster series on Channel 5, so I thought he would enjoy this book a lot. 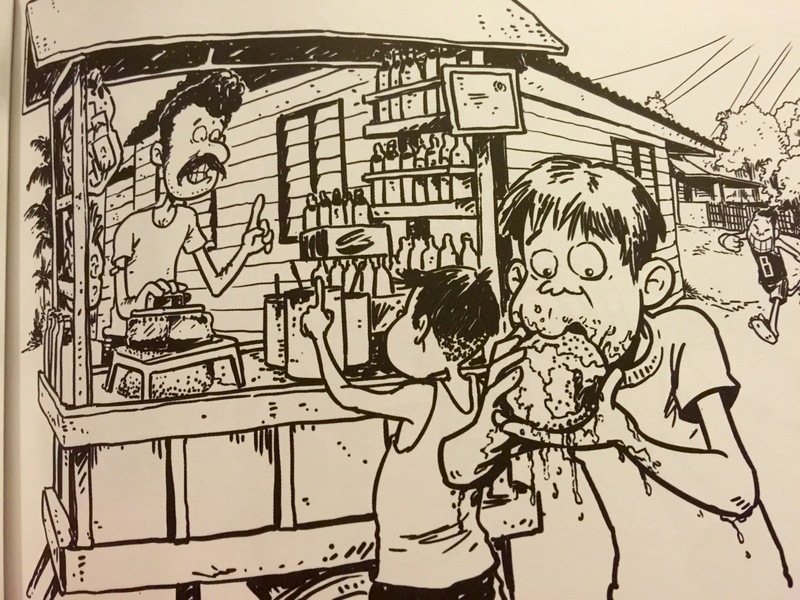 Launched on 25 June 2015 and illustrated by Syed Ismail, the book is Mr Suresh’s personal account of his childhood experiences, lifestyle, recreation, people and practices in the 60s and will appeal to both the young and old. I was glad that the book was a simple read. Each page was a short narrative and just right to read together with Wey… it helped that there were nice (comic) illustrations alongside each narrative. I could tell that as I read it to him, he was captivated and of course amused at how things used to be back in the 60s. Life, it seems, was way simpler then… My favourite quote from the book is “We needed very little then to make us happy.” That simple sentence speaks so much. Today, we have so much and are enjoying a way better standard of living and yet many of us are not content and have become habitual complainers grumbling about everything. I am hopeful to teach my son to appreciate his blessings and to be thankful. To look at the good things in life and not to dwell on the bad things or the things he sees others have that he doesn’t have. To put his attention on working for his aspirations that can come true with hard work and effort. To dream the Singapore Dream and not stand still and blame others when things don’t go his way or happen to his liking. After all, this is the pioneering spirit that my parents and grandparents had and look how much they’ve seen their lives improved and mine as well. 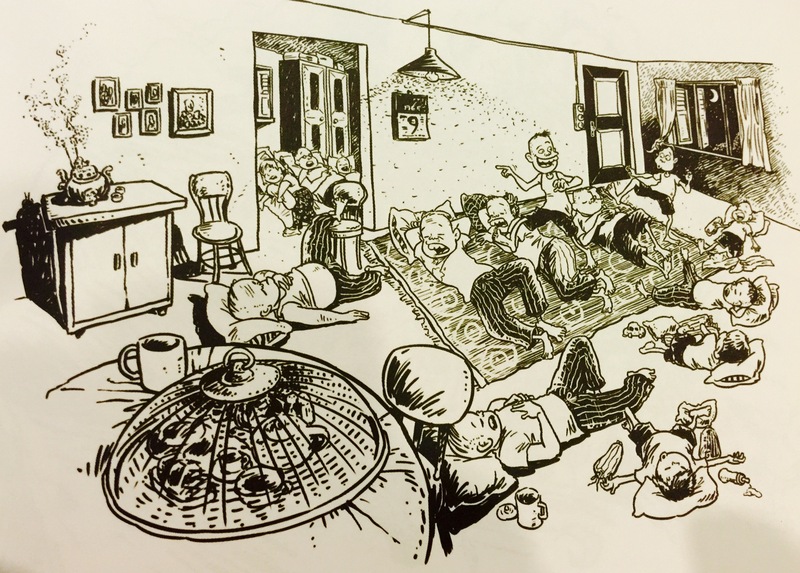 Wey giggled when he saw the illustration of the 4 children squeezing on one bed to sleep. No doubt he was surprised to hear how families used to ‘squeeze’ together in one room and on one bed and still considered themselves blessed and were happy. His eyes almost popped out when he saw the illustration below! Lol! 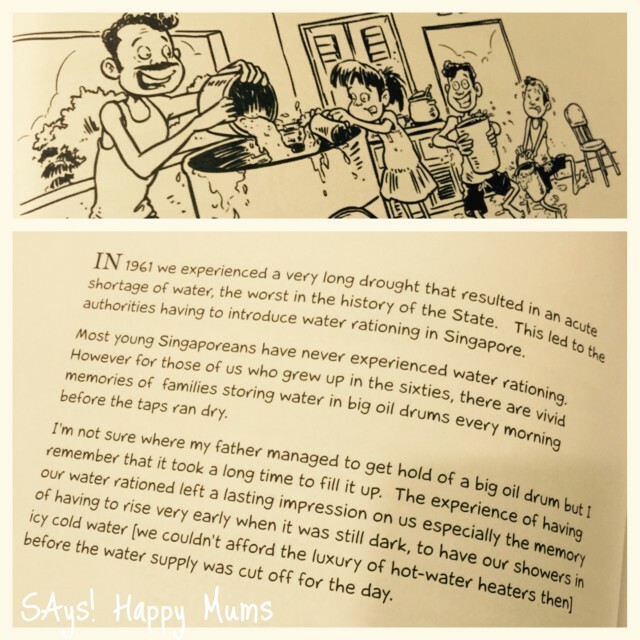 I like that the book gives the younger generation a glimpse into a Singapore past and gives a great start point opportunity to talk with our little ones about all that we take for granted now and to teach them to stop for a moment to appreciate our blessings everyday…. Wey and I both had a good laugh when we read about the strange design of the old SIT flats where neighbours were separated by one single metal bar and children running away from an angry mum would just escape over to the next door via this escape route, leaving the fuming mother stuck on the other side! hahaha!! Bet he was wishing he could have that same escape route away from me or probably imagining me stuck under the bar like the woman in the picture below! We also got to read about what my mum talks about when she eats her favourite Ice Kachang dessert… her dearly missed Ice Ball! In her days, it cost 5cents a ball and they would save up a whole week to buy the Ice Ball. It was pure joy and glee to share it with her sisters when they finally had enough money. haha… My mum would even make the sound of sucking on the Ice Ball to demonstrate how it was eaten… LOL! 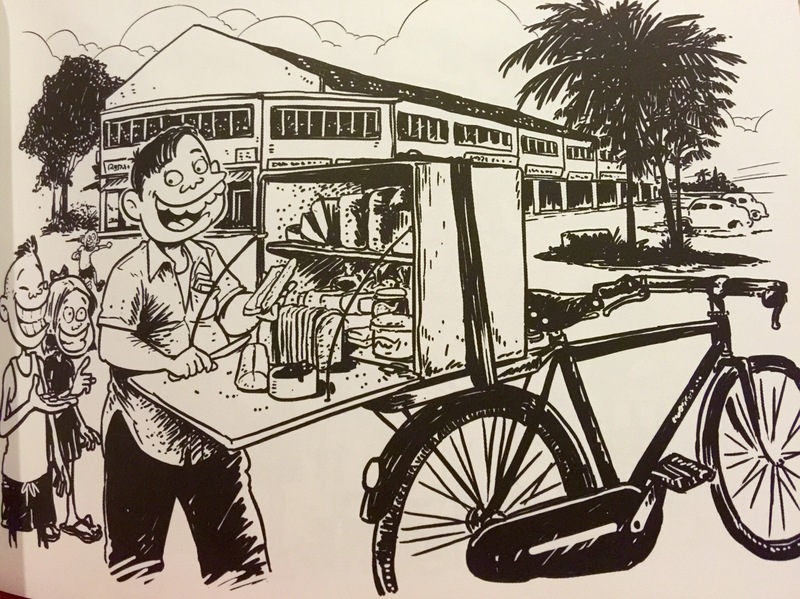 Seeing this illustration below of the Bread Man on bicycle brought back some distant memories of this very very old man that used to come to our estate to sell bread. My Dad would bring me downstairs and we would buy a loaf of old fashioned bread not like the Gardenia’s of today and sometimes we would also ask him to spread some Kaya in it. I am quite sure this old man is no longer alive but I suddenly remember so vividly, his old wooden box sitting on the bicycle as he sliced expertly at our loaf of bread. I’ve never seen a Swill Collector and Wey was particularly curious about this. We had a fun time reading about the ‘barter trade’ of daily leftover food for the pig farmers to feed their pigs in exchange for that one live chicken at the end of the year. I remember my mum had a small grey plastic container in our old HDB flat which she never used. 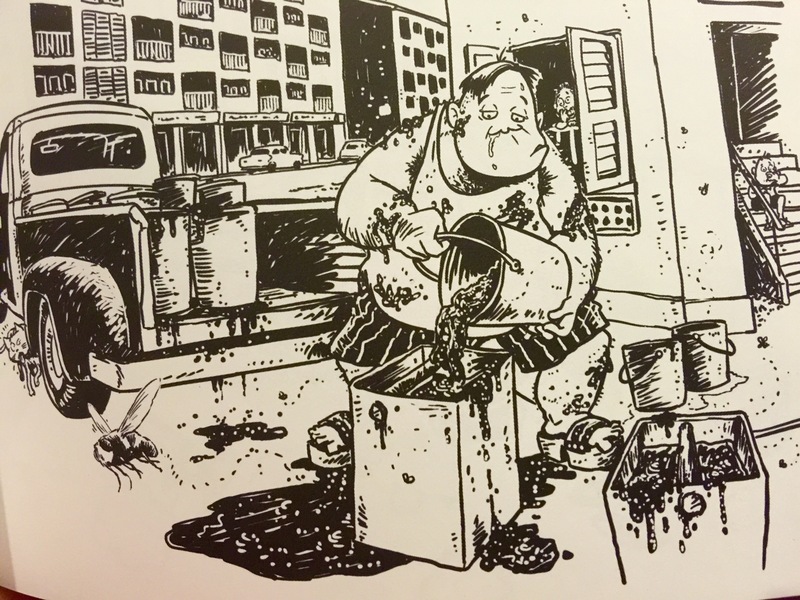 If I’m not wrong, it was for people who participated in the swill programme… haha… amazing how memories come back with this book. 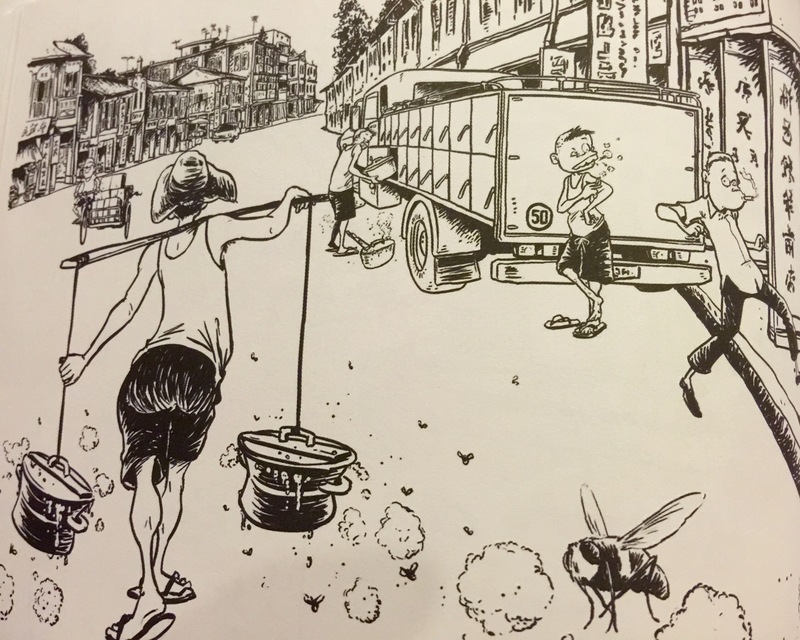 Wey first learnt about the Night Soil Collector when watching KidsFest Horrible Histories’ Vile Victorians earlier this year and he was surprised that not so long ago, we too had night soil collectors serving the many kampong houses. This page really brought back scary memories of mum bringing me to the Kelantan Polyclinic when I was a little girl. I hated that place. It smelt of Dettol and medicine and I hated the long nervous wait to see the doctor. 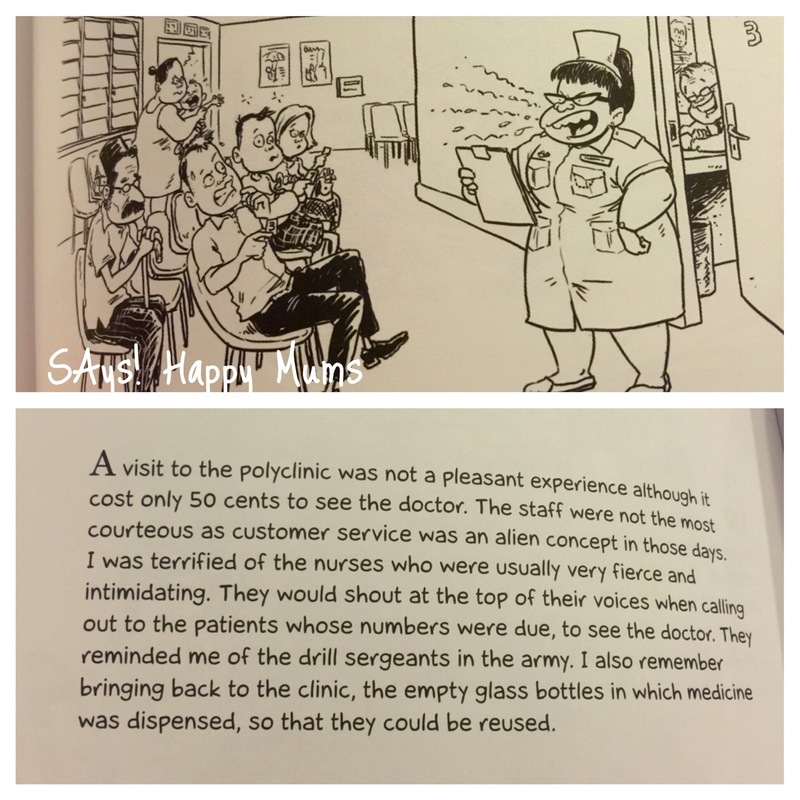 The nurses (known as Mee-see) were somehow the fiercest women on earth! They shouted at the top of their voices at everyone and never smiled! Eeewww! Things are so different today. Perhaps it’s also because the population is better educated and nurses can no longer lord it over those who cannot understand English? Whatever it is, I’m thankful that doctor visits are pretty pleasant and non-fearful for the kids these days. (or so I think?) hahahha… Maybe I should ask Wey what he thinks of the nurses now. Mr Suresh talks of his memories of collecting water in a big oil drum during water rationing exercises and bathing with icy cold water. I actually remember a time when I was a little girl when my mum too would ask me to help collect water in pails to be set aside in our bathroom because of a water rationing exercise. We did it with no grouse or complain and simply took it as how things were. In fact, I was excited. My mum would boil some water and add it to an empty pail to mix with the water collected earlier before the rationing exercise. I thought it was fun to scoop water from a pail and splash it on myself instead of using our water heater hehe…. This is a great book for parents or grandparents wanting to share the good old days with the little ones without having to plough through a ton of words. Wey and I had a fun walk through Old Singapore as we read the book together. Each page is a digestible bite size story packed with information that will not bore young ones and will definitely bring some great memories and discoveries for children, parents and older folks too. So do try to borrow it at the library when it becomes available. I hope that some will be made available for sale as it’s a cute keepsake about Singapore and I would imagine a fun gift for overseas friends and family! Although the book is not available for sale to the public, we’ve got great news! The Influencer Media has 50 copies to this limited edition keepsake to be given away! So don’t miss this chance, do hop on over here to take part and share, contest ends on National Day, 9 August 2015! 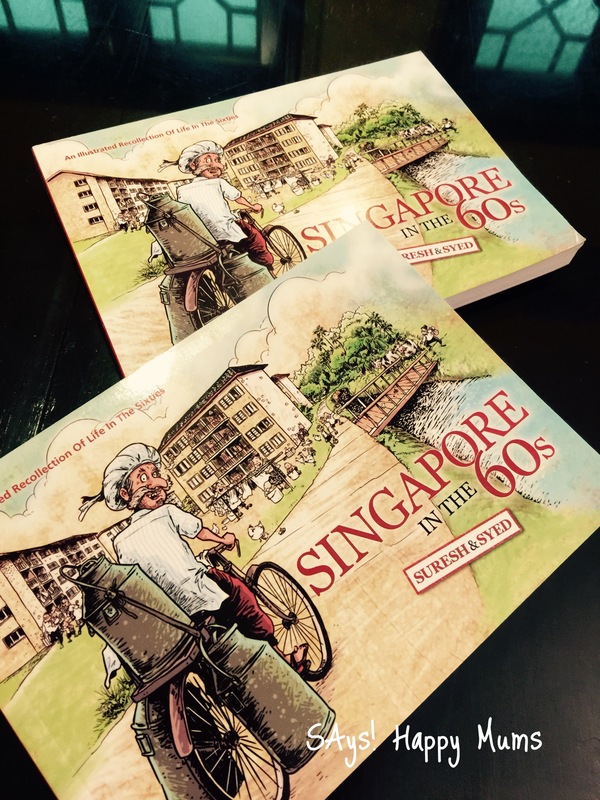 Bestselling author and co-creator of comic icons such as Mr Kiasu, On a Street in Singapore and Kopi Tiam, James Suresh produces a SG50 illustrated book about life in the 60s when he grew up in a rented flat in Queenstown. ‘Singapore In The 60s’ will be a personal recollection of experiences seen through the eyes of author James Suresh who grew up in a rented flat in Margaret Drive, Queenstown, one of the first housing estates in Singapore. The flats have since been demolished but the memories of life in the sixties will help the young to appreciate the past and the older Singaporeans to recall and reminisce about days gone by. With the assistance of the Character and Citizenship Education Department at the Ministry of Education, of the 5,000 SG50 sponsored books, some 4,500 will be placed at school libraries with 10 copies made available to each school library in Singapore. Mr Suresh intends to donate the remaining books to his former primary school, secondary school and other institutions where he pursued his studies. Thanks for joining us on SAys!Happy Mums. If you liked what you read on our blog, please follow us on Facebook for the latest updates. We hope to see you back again soon. Disclaimer : We received 2 copies of the book for the purposes of this review. All opinions expressed remain our own.